No single definition for middle class exists, but it's often considered between 67% and 200% the median income - and is based on a variety of factors including wealth and consumption. The term "middle class" is often thrown around by politicians and economists. But it's an ambiguous label. And while there are several measures of a technical definition of middle class, it is often more of an idea or estimate than a firm number. Unlike the federal poverty level, "middle class" has never been officially defined by the government - leading to some wild-swinging estimates. What's more, income inequality is increasing - with a shrinking middle class and recently-elected politicians touting a higher tax rate for the wealthy (as high as 70% on income above $10 million, which would currently affect less than 1% of households). Still, there are several concrete ways to measure middle class - including by income, wealth, aspiration and consumption. So, what is "middle class," and how is it calculated? Middle class is loosely defined as those who fall into the middle group of workers compared to the bottom 20% or top 20%. However, middle class has also been defined as those earning between 67% to 200% of the median income or even those with certain consumption or wealth metrics. Although there is no single definition of middle class, it is generally applied to those that fall between the lowest-earning households and the highest-earning households - generally the middle two-thirds of the income spectrum. However, there are several other ways economists and analysts have calculated what middle class is, including income, wealth, consumption and aspiration. While there are a multitude of ways to estimate what middle class means - from expenditures to a hypothetical ideal of what a middle-class lifestyle should consist of - income is generally the most common estimator of a middle-class range. In fact, for many, the definition of middle class is quite convoluted. For one, Richard Reeves, a senior fellow at Brookings Institution and director of its Future of the Middle Class Initiative, seems to acknowledge the embedded ambiguity in the term "middle class." "I sometimes think there are as many definitions of the middle class as there are Americans claiming to be middle class," Reeves told Fortune last month. "You're middle class if you have two refrigerators. You have a new one in your kitchen, and you have your old one in the garage or basement, where you keep your beer." Despite the confusion, there are several metrics commonly used to determine what middle class actually is. How Is Middle Class Measured? So, what are the ways in which middle class is measured? While income is generally the most common metric when comparing lower, middle and upper class, there are several other ways economists, analysts and others have measured what being "middle-class" really means in the U.S. In terms of income, Pew Research Center has designated that a middle-class income is between 67% and 200% of the median income (based on numbers from 2016.) And, according to Pew, over half (52% to be exact, as per a 2018 report) of Americans lived in a middle-class financial state (or, in a middle-income household). For Pew data, middle-class income for annual household income is two-thirds to double the national median. While an income-based definition of middle-class relies on the money coming in to a household from a job(s), wealth-based metrics of middle class are more about the kind of financial situation a person is in regardless of income - like retirees or those with savings or other means to sustain a lifestyle. For middle class, those who fall into the middle three-fifths of the wealth spectrum are considered to be middle class - while those with zero and under wealth are considered in debt. Similarly, those above the middle three-fifths are considered wealthy. According to New York University Professor Edward Wolff, those with $0 to $401,000 are considered middle-class on the wealth spectrum. On the slightly more unusual side, President Obama designated a task force to examine another area when defining the middle class in 2010 - that of their aspirations. Aspirations could include anything from home ownership and a car to college education for children and even vacations. And while aspirations may seem to be a shoddy method of defining the middle-class (given that aspirations may vary despite the increased standard of living over recent decades), some still take the method into consideration when defining what kind of lifestyle the middle class should support. Yet another logical method of defining the middle class is to look at households' consumption - or, how much individuals spend. Spending may or may not be affected by income, as it is generally used as a metric apart from income to include those who may be living off of a fund, government payments or the like. According to the consumption metric, middle class is defined as those who annually spend between $38,200 to $49,900 for a four-person household. Based on Pew Research Center data for the 2017 fiscal year within the Center's parameters, an income range of $41,000 and $132,000 is considered to be middle class. Most 2019 reports have been based on the Pew Research Center report using 2017 data. Additionally, other reports using Pew data conclude that a middle class four-person household would be in the range of $46,960 to $140,900 in income. Based on 2017 estimates, the median income is around $61,000 (half of U.S. households made more and half made less than $61,000 in income). However, according to the Tax Policy Center (which measures income in quintiles, or 20% segments), households falling into the 40th to 60th percentile of income distribution make an estimated $50,000 to $90,000 (relatively in the same ballpark as Census data estimates). Based on 2016 Pew estimates, a household of one should have around a minimum of $26,000 for middle class; a household of two should have an income of around $36,900; a household of three should have an income of around $45,100; a household of four should have an income of around $52,100; and a household of five should have an average of around $58,300 in income to be considered middle-class. Although estimates vary, Pew Research Center has claimed that a middle-class income-range is anywhere between $40,500 and $122,000 per year. However, the U.S. Census Bureau put household middle-class income ranging from around $35,000 to $99,999 for 2017 data. Yet, estimates vary greatly depending on household size, county and state. For example, Jackson, Tenn. has one of the lowest middle-class ranges, with a before-tax salary of $37,106 for a three-person household being considered middle class as of 2018. Additionally, both President Obama and President Trump have used the figure of $200,000 as the minimum for high-income tax rates, although actual high-income figures have varied over the years. And President Trump's 2016 tax plan delineated singles making $37,500 to $112,500 and couples making $75,000 to $225,000 to be middle class. Still, even within the middle class itself, there are different tiers of income - namely, upper vs. lower middle class. Based on Pew research using 2014 data, households making between $31,000 to $42,000 were considered lower-middle class, while three-person households making between $126,000 to $188,000 were considered upper-middle class. Other estimates for upper-middle class income ranges from $100,000 to $149,999 and lower-middle class and middle class ranging from the mid $35,000 range. 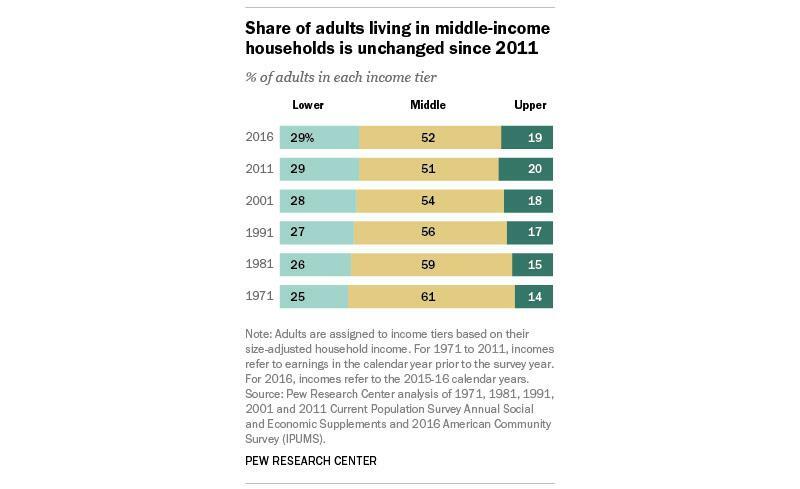 But although recent discussion suggests the middle class is shrinking, according to 2016 figures from Pew Research Center, the percentage of adults living in middle-income households hasn't changed too dramatically in recent years. However, as nearly every politician has discussed in recent years, the middle class does appear to be shrinking - especially with slower growth in middle to upper-middle classes as the top-earning classes appear to grow. In fact, according to Pew data, the percentage of adults living in middle-income households fell from 61% in 1971 to around 52% in 2017, while the percentage of adults living in upper-income households grew from 14% to around 19% over the same time. "There's a loss of jobs in the middle and growth at the top and bottom," Robert J. Gordon, professor of economics at Northwestern University, told U.S. News in July. "In that sense, the middle class has been hollowed out." While as of 2018, a little over half the population in America (52%) is in a "middle-class" income range, according to Pew, reports from 2015 claimed that less than half of Americans were considered middle class (less than 50% per Pew data). Additionally, according to Pew Research Center data, average hourly earnings as of November 2018 were around $23 - which, when adjusted for inflation, is actually less than it was in January of 1973 (which would come in at around $23.68 for 2018). So, while the percentage of Americans in the middle class may be slightly improved in recent years, their purchasing power may actually be decreasing. Notably, politicians have long been vocal about protecting the middle class - especially in the recent political climate. In fact, staunch defender of the so-called middle class and recently elected Congresswoman Alexandria Ocasio-Cortez recently advocated for a 70% marginal tax rate on the wealthiest income brackets (those earning at least $10 million in income) in a seeming attempt to alleviate the burden on the middle and lower classes. The Congresswoman has taken to Twitter (TWTR - Get Report) to voice her concerns over the issue, including challenging high-ranking members of Congress to debate. You're the GOP Minority Whip. How do you not know how marginal tax rates work? On the other side of the spectrum, President Trump's Tax Cuts and Jobs Act (TCJA) sought to cut taxes for middle-income families (which the administration seemed to imply were single-member households making $200,000 or less) - but, more noticeably, reducing the top Federal marginal corporate tax rate from 35% to 21% - pushing some markets and stocks higher, like Salesforce (CRM - Get Report) . Still, while there has been much debate over the particular parameters of middle class, it is clear through various reports that, while the percentage of adults in middle-income houses may not have waned too dramatically, their purchasing power and cost of living expenses have seemingly hurt them. In fact, the cost of other expenses like rent, tuition or medical expenses have risen faster than income in recent years, according to a Fortune report last month. There are several online income calculators - including one that lets you put in your county and state as well as your income. Pew Research Center has a calculator that includes size of household and other factors. Given that components like the cost of living, minimum wage, average household size and various other demographics affect the average middle-class income in different states, calculators that take county and state into consideration are generally a good indicator of where you stand against national and local averages.